The focus of the ICEC is to establish sustainable mentorship and partnership relationships in order to enable the provision of cancer care to health disparities populations in LMICs and also in rural underserved areas in resource-rich countries that have similar access issues to those in LMICs. Prevention and sound health policies are key components to reducing the incidence and consequences of cancer. Given the number of people who already have and will be diagnosed with cancer treatments are needed to provide cure and/or relief of symptoms. To help fill the huge gap in cancer care, ICEC aims to establish person-to-person sustainable relationships at a global level such that mentors, mentees and partners can work effectively together to help create workforce capacity and capability. Sufficient infrastructure is needed to facilitate recruitment, conduct day-to-day operations, establish appropriate metrics for individuals and institutions to guide progress and build mutually beneficial relationships with organizations working to help solve the global cancer health disparities problem. 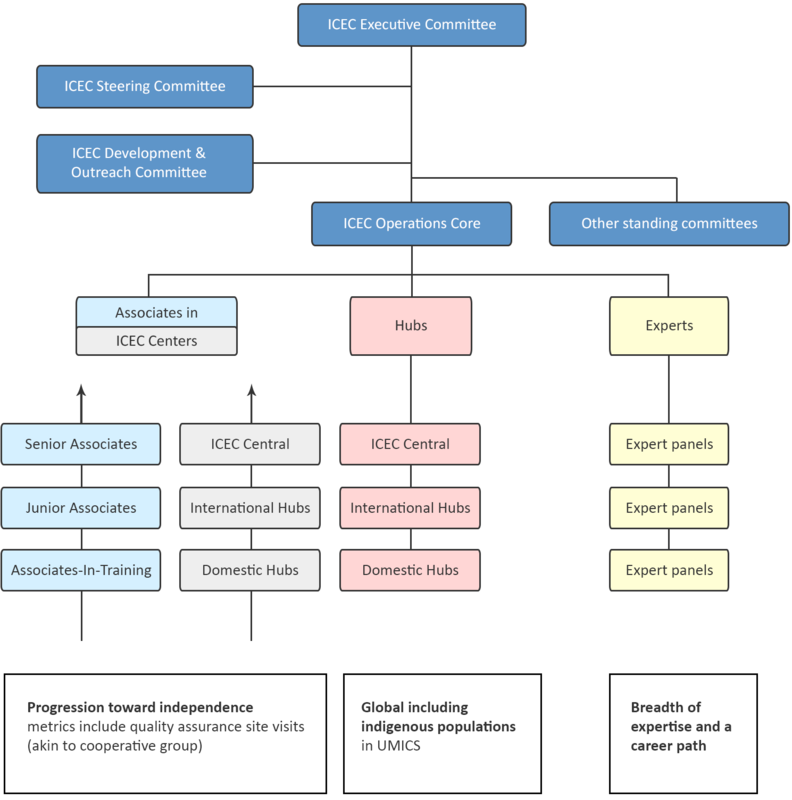 The ICEC aims are to build capability and capacity for cancer care by mentoring Associates in ICEC Centers in resource-limited settings. Through education and training ICEC Experts will assist the Associates in collaborative investigation that will help the global community improve cancer care outcomes. Through a progression of skill development and accomplishment the Associates will progress from in-training, to Junior to Senior Associate. The Center will progress from ICEC Developmental to Provisional to Full member by passing quality assurance site visits in the conduct of guideline and protocol based care. The mentors will be organized in Expert panels based on discipline and expertise. Thus, there will be a global network of people sharing information and approaches among Associates and Experts. The infrastructure or “nerve-net” will be the Hubs, which will provide resources, personnel and connectivity for the Associates and Experts to allow them to focus on their cancer care mission. Associates are local oncology care givers serving disparities populations working in medical facilities/locations who are interested in participating and investing in improving the quality of care and life for their affected citizens. They will provide the local leadership to “champion” the program and rally local participation. As they reach levels of skills in guideline and protocol-based care they progress from Associate-in-Training to Junior to Senior Associates. These ICEC Centers will progress from Developmental Member to Provisional Member as the overall skill and breadth of the Center progresses and ultimately to Full Member, which requires passing a “cooperative group” quality site visit. They can then serve as a hub for their region. Experts include the range of oncology disciplines, healthcare delivery services and public health/economics/policy. Multiple ICEC experts will mentor an Associate/ICEC Center in the conduct of protocol-based care and not on individual patient management. There will be required commitment of time and effort. Experts would include senior expert academicians and practitioners and faculty at the range of academic ranks from institutions that will help design and support a formal career path, with metrics, for human service. Experts may join as individuals, institutions, societies or teams.